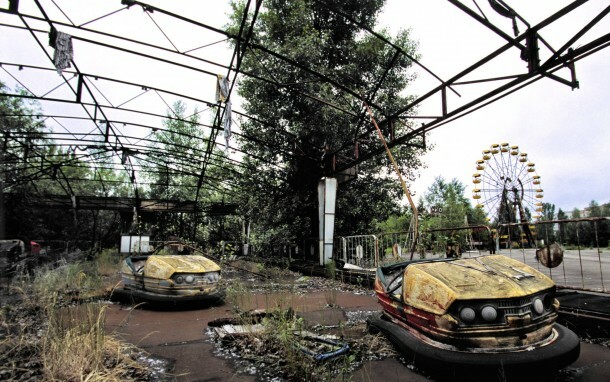 1 - Establishing shot of present-day Pripyat, forest abounding and the reactor in the background (not unlike the image here). Let's say it's winter, approaching sundown (if not a little bit beyond). Birds fly in the sky above the city. CAPTION: Echoes of the Soviet Union are by no means hard to come by. 2 - On the (in? )famous Ferris wheel. An elk stands nearby, looking up towards a sound off-panel. CAPTION: But nowhere are they louder than under the shadow of Reactor 4. 3 - A pack of wolves run through the bumper cars towards the Ferris wheel (visible in the background, not unlike this photo). CAPTION: For while ghosts can be found most anywhere one dares to look. 4 - The wolves have downed the elk and ear tearing at its carcass. One wolf looks up towards the reader, its eyes bright in the night. CAPTION: It is only here that they glow. This sounds like the start of a horror story of some kind. Radioactive attack wolves?